is one of the most incredible animal interactions in the world. An unforgettable experience in an incredible place. No dive certification is required. Participants in a Soft-In-Water Encounter may use mask, snorkel and fins; but no SCUBA or rebreather equipment of any type is allowed. In a Soft-In-Water encounter there is no aggressive swimming or freediving. Participants are also required to stay together as a group. 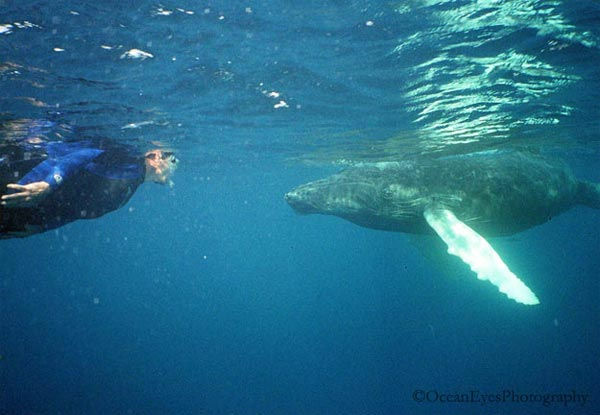 So though it is commonly referred to as "swimming with whales," there is little swimming involved! 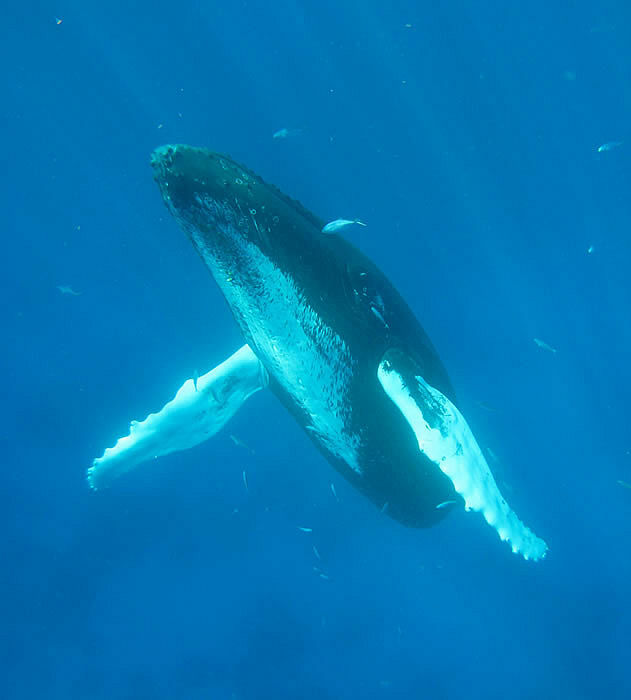 By entering the water quietly, and floating peacefully as a group, the participants minimize any disturbance to the whales, and then allow the whale to choose to approach or not. It is an encounter in their environment, on their terms. Hispaniola, the second largest island in all the Antilles, is shared by the nations of Haiti and the Dominican Republic with the DR occupying the eastern two thirds. Lying 70 miles north of the coast, the Silver Bank is part of The Sanctuary for the Marine Mammals of the Domincan Republic. It is here, in a designated anchorage, that the Sun Dancer II moors for the duration of your visit. 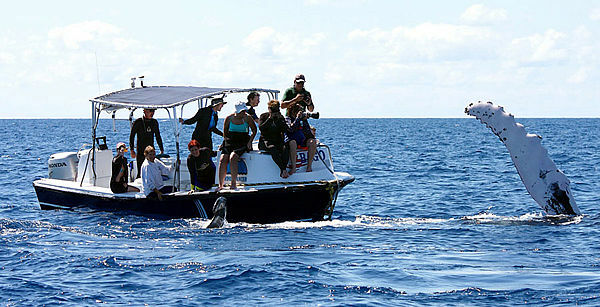 Tenders take our small group in search of whales each day. Sun Dancer II is one of only three vessels to hold a permit to bring visitors into Sanctuary waters. Only 60 visitors are permitted each week and regulations to ensure the integrity of the Sanctuary and safety of the whales are carefully followed. Trips to Silver Bank are offered annually, from early February through late March. All trips board on Saturday at 5:00PM and disembark the following Saturday at 8:30AM. The 138 ft M/V Sun Dancer II can comfortably accommodate 18 passengers. The M/V Sun Dancer II features four decks, three of which are passenger decks. All decks are spacious, comfortable, and well appointed, with air conditioning in all interior areas. 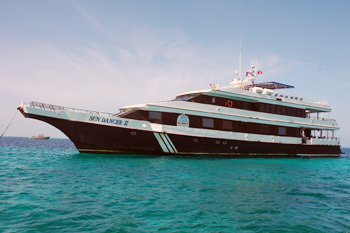 The M/V Sun Dancer II sleeps a maximum of 18 guests. There are two Master Staterooms and seven Deluxe Staterooms. Each stateroom has en suite facilities, individual climate controls, picture windows and flat screen TV with DVD player. In addition a mirrored cabinet, wardrobe, bathrobes, hairdryer, toiletries, and fresh towels daily are provided. Electricity throughout is 110 volts AC, provided from US style outlets. The spacious Dive Deck features two freshwater showers, warm fresh towels, a water fountain, and separate rinse tanks for cameras and snorkel gear. For the photographer, there are two large camera tables, and all guests have their own dedicated gear station. A complete line of modern marine electronics contribute to the safety features of the vessel. American citizens need a passport good for 6 months and a DR round trip ticket as well as purchasing a Tourist Card at the airport of entry. A visa may be required if you wish to stay longer. Citizens of other countries should check with authorities for requirements. You'll need to bring your own mask, snorkel and fins, or plan on renting. You may also wish to bring or rent a wetsuit. Shorts, t-shirts, bathing suits, sweater, and wind breaker should be adequate for the week on board. Don't forget personal toiletries, sunscreen and meds, sunglasses, hat, camera, good book and a notebook and pen. Remember, this is a week long live-aboard adventure and you should feel very comfortable on the water. We suggest purchasing trip cancellation insurance and also dive insurance which covers snorkeling. With a lifetime of experience on the water, Capt. Gene Flipse has been a US Coast Guard licensed captain for over eighteen years. Capt. 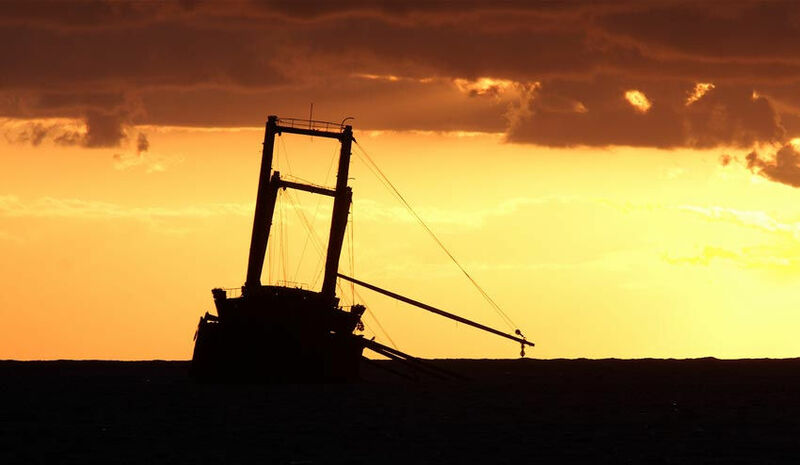 Flipse holds a 100 Ton Near Coastal Master's License, as well as STCW 95 Certification (Standards of Training, Certification and Watchkeeping). A career professional, Gene has spent the last twelve years as captain aboard live aboard dive boats operating on the waters of Florida; the Bahamas; and the Sanctuary for the Marine Mammals of the Dominican Republic on the Silver Bank. Arrive Cofresi/Puerto Plata, Dominican Republic. Check in at 5PM at Ocean World Marina, Cofresi. You will be given cabin assignments; vessel safety & operations orientations and dinner. 11PM departure for Silver Bank. Vessel arrives on the Silver Bank and gets operation set up. 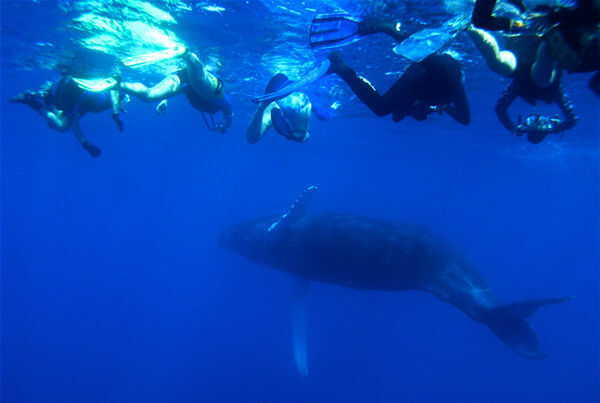 Snorkeling & Humpback Whale orientations. Afternoon excursion in tenders, sundowner celebration and evening activities. 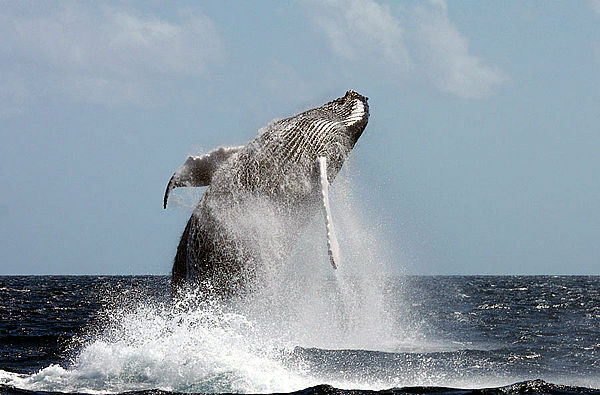 Whale excursions daily in the tenders and full days snorkeling, soft-in-water encounters with the Humpback Whales. Sundowner celebrations each night and evening activities showing slideshows, discussion of sightings, etc. Depart Silver Bank early AM. Vessel arrives Ocean World Marina, Cofresi approx. 4:30PM, vessel and passengers clear DR customs & immigration. Free time to explore ashore, shop and get dinner (not included in package). Continental Breakfast on vessel. 8:30AM guests disembark vessel. You may decide to explore the resort areas of Cofresi/Puerto Plata before heading home with incredible memories of your Humpback Whale encounters.